Of all the 20 arrondissements of Paris, the 10th is the one with the smallest proportion of green space. This is hardly surprising when you think it is home to two of the biggest train stations in the city (Gare de l'Est and Gare du Nord) and two big hospitals (Hôpital Lariboisière and Hôpital Saint Louis). The hospitals have small gardens within, but the train stations take up huge amounts of space, not only with the terminal buildings but also a considerable chunk of territory with their tracks that spread out north and north-east through the arrondissement on the start of their journeys to exotic places from Bondy to Brussels, Sarcelles to Strasbourg, from Livry to London. The area has several pleasant (though small) gardens which are worth a visit. But if you really want to see the wild side of the 10th, your best bet is to take a stroll along the Canal Saint Martin. This wonderful amenity stretches over 4.5 kilometres between the Bassin de la Villette and the port de l'Arsenal, near Place de la Bastille. Part of this course is underground (covered by the Boulevard Jules Ferry and Boulevard Richard Lenoir), but most of it is open air. 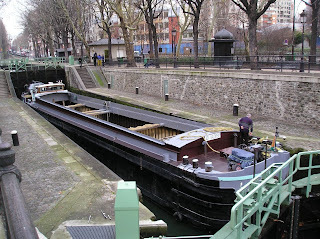 The visible portion of the canal is entirely in the 10th arrondissement. The canal was built in the 19th century to provide the city of Paris with drinking water and also to serve as a means of transport for heavy merchandise in and out of the city. Its golden age was from the 19th century to the middle of the 20th. During this period many factories and warehouses were built along its banks and the population of the 10th was principally made up of working class families. With the growth in road and rail transport the canal fell into disuse and almost disappeared in the 1970s when a plan was proposed to cover in the canal and build a four-lane highway along its route. Fortunately this plan was never put into action and the canal and its banks remain today a source of pleasure to inhabitants and visitors alike. Most of the traffic on the canal today consists of tourist barges and private pleasure vessels, though the occasional industrial cargo can be seen negotiating the nine locks. 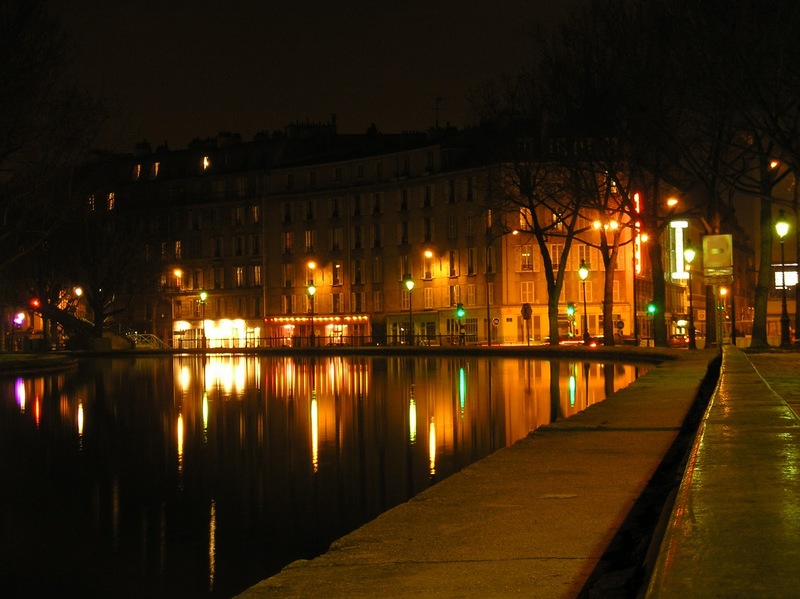 The banks of the canal along the Quai de Jemmapes and the Quai de Valmy are a much-used amenity. The quays are closed to motor traffic on Sundays and national holidays to make way for pedestrians, cyclists and skaters: from 10am to 8pm in summer (April-September) and 10am to 6pm in winter (October-March). On summer evenings the quays are thronged with picnickers and musicians. Film buffs will already know the canal scenery from the 1938 film Hôtel du Nord by Marcel Carné, or the more recent Amélie (Le Fabuleux Destin d'Amélie Poulain) by Jean-Pierre Jeunet (2001). The range of wildlife in and around the canal may surprise. In the water itself there are several varieties of fish. If you're not in a hurry, set up your rod, park yourself on a stool and wait for the roach, carp, tench, bream, trout, pike, eels or perch to bite. If you're lucky you might even catch some crayfish. If you look hard you may also spot a muskrat. The flora along the banks is also quite varied. You'll find poplar, sycamore, plane, cherry, chestnut, beech, some of them over 100 years old. While you're looking up at these wonderful trees you will no doubt see lots of pigeons and sparrows, and also the occasional visitor from the coast – seagulls. Yes, at over 100km from the sea. But look down too! Under your feet you'll find various grasses, dandelions, plantains (not the variety of banana! ), groundsel, wild chamomile.